Designed to be the highest output GM style HEI in-cap ignition coil, period. Compatible with both original HEI ignition systems and later model computer ccontrolled HEI systems. Can also work with Accel, Mallory, Crane, Holley or MSD capacitive discharge ignition system. No need to remove or re-time the distributor. Accel Brute Thunder HEI Super Coils come complete with simplified ground strap, mounting screws, silicone coil gasket, low Ohm contact brush/spring and an Accel tan coil cover. Effective to 9,000 RPM. 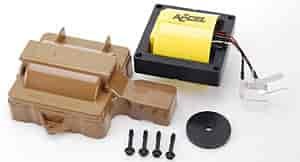 Does Accel 140013 fit your vehicle? 140013 is rated 5.0 out of 5 by 1. Rated 5 out of 5 by GTOnut from Superior product. I converted my '70 Goat to HEI, and replaced the stock coil with this Accel unit. What a difference! The Accel coil smoothed my 428's idle considerably over the stock unit.